My last day trip in Australia took me South-West of Cairns, to the Atherton Tablelands. An area that still feels very rural and offers many natural beauties. Interesting was already the bus ride up through the Gillies Range towards the Tablelands, where we noticed that the rain forest changed to regular forest. The change was so abrupt that it felt like an invisible line had been drawn through the landscape! 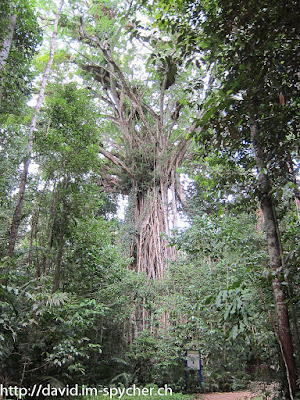 One of the first stops was at the humongous Cathedral Fig Tree. The Cathedral Fig Tree is so named because you can stand among its roots and it looks like a cathedral. This tree is a Strangling Fig Tree and they have a very interesting life. They start as a seed which is dropped by birds on top of other trees. There it gains hold and has instant access to light, which is a main consideration to grown in a rain forest. It will then grow a long root along the tree down to the floor. Once this root has a hold, it can take up nutrients allowing the plant to grow additional roots. All these roots grow around the original trees stem, reducing it's ability to grow, and thus strangling and eventually killing it. After a while the original tree will rot away leaving a hollow part inside through which you can look up! Our next stop was a lake where we spotted two ducks resting under a picnic table and went for a short rain forest walk. There we met ancient and very impressive trees and our first Dragon! 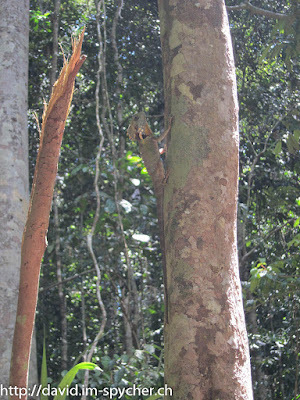 We walked right past it, the guide had to tell us where to look before we spotted this intriguing lizard. It was a Boyd's Forest Dragon, hanging 1.5 meters from the floor on a tree without moving, it probably thought that if it didn't move it couldn't be seen, which would almost have worked ;). Before lunch we went for a swim at a nearby lake and there we spotted another Dragon! 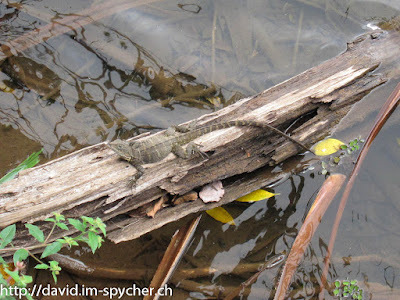 This time it was a Water Dragon, sitting on a log near the shore :). 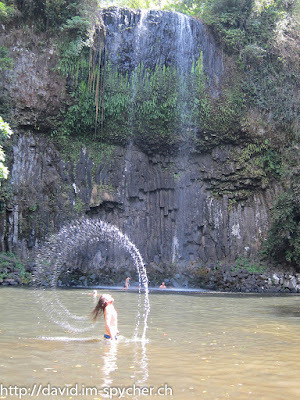 After lunch we visited the famous Millaa Millaa Waterfall, which offers the perfect environment for shampoo commercials! After another relaxing swim we headed to Dinner Falls, which used to be a place for picnics a century ago, but since a small dam was built it offers another small pool for swimming instead. Our last stop was near Yungaburra, where we visited a place where Platypus are frequently spotted, unfortunately, we were out of luck and didn't see one of them. It was an enjoyable day trip and with a bit more luck we might have seen even more exotic wildlife. These pictures can be seen in my web album.